Were Hedge Funds Right About Starting To Dump BlackRock, Inc. (BLK)? Is BlackRock, Inc. (NYSE:BLK) a good equity to bet on right now? We like to check what the smart money thinks first before doing extensive research. Although there have been several high profile failed hedge fund picks, the consensus picks among hedge fund investors have historically outperformed the market after adjusting for known risk attributes. It’s not surprising given that hedge funds have access to better information and more resources to find the winners in the stock market. Is BlackRock, Inc. (NYSE:BLK) a first-rate stock to buy now? The best stock pickers are turning less bullish. The number of bullish hedge fund positions dropped by 4 recently. Our calculations also showed that BLK isn’t among the 30 most popular stocks among hedge funds. BLK was in 36 hedge funds’ portfolios at the end of December. There were 40 hedge funds in our database with BLK holdings at the end of the previous quarter. Let’s take a glance at the new hedge fund action encompassing BlackRock, Inc. (NYSE:BLK). Heading into the first quarter of 2019, a total of 36 of the hedge funds tracked by Insider Monkey were bullish on this stock, a change of -10% from the previous quarter. 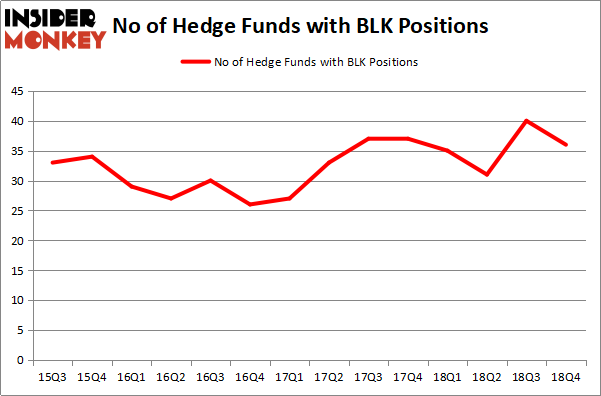 The graph below displays the number of hedge funds with bullish position in BLK over the last 14 quarters. So, let’s see which hedge funds were among the top holders of the stock and which hedge funds were making big moves. When looking at the institutional investors followed by Insider Monkey, Ken Griffin’s Citadel Investment Group has the biggest position in BlackRock, Inc. (NYSE:BLK), worth close to $291.6 million, comprising 0.2% of its total 13F portfolio. On Citadel Investment Group’s heels is John Overdeck and David Siegel of Two Sigma Advisors, with a $124.4 million position; 0.3% of its 13F portfolio is allocated to the company. Remaining peers that hold long positions contain James Parsons’s Junto Capital Management, Dmitry Balyasny’s Balyasny Asset Management and Tom Gayner’s Markel Gayner Asset Management. 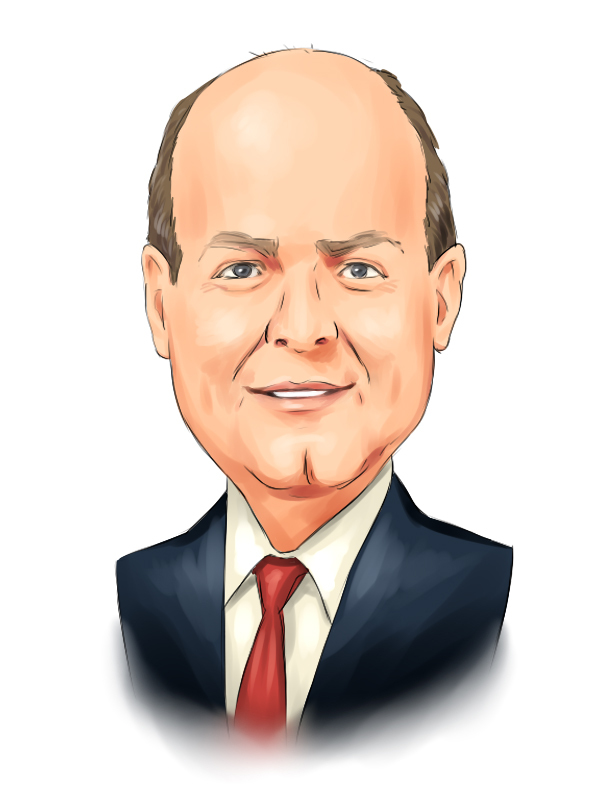 Seeing as BlackRock, Inc. (NYSE:BLK) has witnessed a decline in interest from the aggregate hedge fund industry, it’s safe to say that there lies a certain “tier” of money managers that elected to cut their full holdings heading into Q3. At the top of the heap, Daniel Lascano’s Lomas Capital Management dropped the largest investment of the “upper crust” of funds followed by Insider Monkey, valued at an estimated $20.1 million in stock. Matthew Tewksbury’s fund, Stevens Capital Management, also cut its stock, about $10.4 million worth. These moves are intriguing to say the least, as total hedge fund interest dropped by 4 funds heading into Q3. Let’s now take a look at hedge fund activity in other stocks – not necessarily in the same industry as BlackRock, Inc. (NYSE:BLK) but similarly valued. These stocks are Goldman Sachs Group, Inc. (NYSE:GS), Ambev SA (NYSE:ABEV), Duke Energy Corporation (NYSE:DUK), and Sony Corporation (NYSE:SNE). This group of stocks’ market values are similar to BLK’s market value. As you can see these stocks had an average of 31.25 hedge funds with bullish positions and the average amount invested in these stocks was $2002 million. That figure was $1066 million in BLK’s case. Goldman Sachs Group, Inc. (NYSE:GS) is the most popular stock in this table. On the other hand Ambev SA (NYSE:ABEV) is the least popular one with only 13 bullish hedge fund positions. BlackRock, Inc. (NYSE:BLK) is not the most popular stock in this group but hedge fund interest is still above average. This is a slightly positive signal but we’d rather spend our time researching stocks that hedge funds are piling on. Our calculations showed that top 15 most popular stocks among hedge funds returned 19.7% through March 15th and outperformed the S&P 500 ETF (SPY) by 6.6 percentage points. Unfortunately BLK wasn’t in this group. Hedge funds that bet on BLK were disappointed as the stock returned 11.2% and underperformed the market. If you are interested in investing in large cap stocks, you should check out the top 15 hedge fund stocks as 13 of these outperformed the market. Were Hedge Funds Right About Buying Costco Wholesale Corporation (COST)? Were Hedge Funds Right About Buying United Technologies Corporation (UTX)? Were Hedge Funds Right About Dumping Twenty-First Century Fox Inc (FOX)? Itau Unibanco Holding SA (ITUB): Are Hedge Funds Right About This Stock? Hedge Funds Have Never Been This Bullish On Thermo Fisher Scientific Inc. (... Do Hedge Funds Love Diageo plc (DEO)?